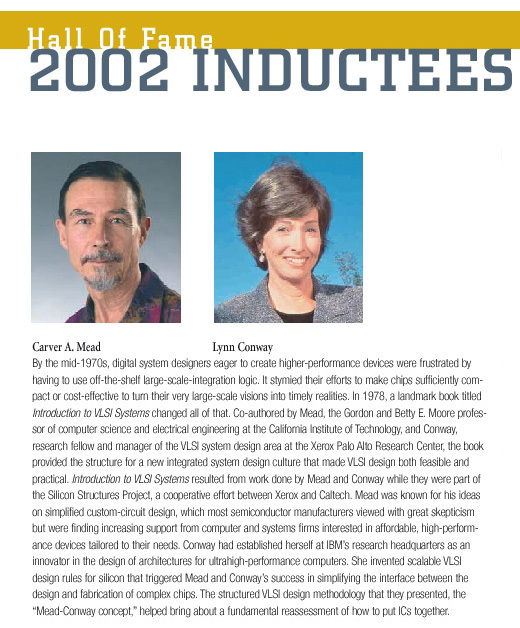 In this special issue, Electronic Design magazine officially launched its "Hall of Fame" of electronic design with a list of 58 individuals who have made landmark career accomplishments in electronics. The list was developed during an open voting process in the electronic design community. The Hall of Fame includes such notables as Thomas Edison, Guglielmo Marconi, Nikola Tesla, Edwin Armstrong, Alan Turing, Claude Shannon, John von Neumann, Hedy Lamarr, William Shockley, John Bardeen, Walter Brattain, William Hewlett, David Packard, Bernard Gordon, Steven Wozniak, Steven Jobs, Robert Widlar, J. Presper Eckert, John Mauchly, Charles Kao, Robert Metcalfe, Jim Clark, Marc Andreessen, Linus Torvalds, Al Shugart, Dennis Ritchie, Robert Noyce, Gordon Moore, Jack Kilby, Andy Grove, Ted Hoff, Grace Hopper, Vint Cerf, Seymour Cray, John Backus, and other major contributors to electronics design.